Today's offer: 2 for £3 on ready meals, and more! Today’s offer: 2 for £3 on ready meals, and more! 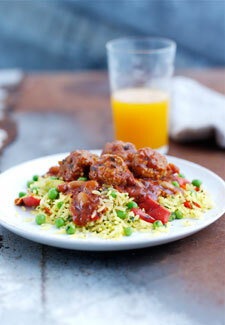 Join in the frozen food frenzy and enjoy hearty ready-meals that will save you time and money. Tesco are offering 2 for £3 on selected meals, such as Italian Chicken & Bacon pasta bake, Chicken casserole and spinach & ricotta cannelloni – priced down from £1.70 each. Each delicious recipe has been sourced from different corners of the world, to bring you some of your favourite dishes for a fraction of the price! Typically priced at £3 each, the 2 for £5 offer includes dishes such as Sticky chilli beef, Chicken paella and Pork & chorizo meatballs with rice. Tescos Everyday range is also on offer. Enjoy a past-time favourite like Corned beef hash or Chicken hot pot for only £1 each. See whats in store or online today!